Particle linear image velocimetry (PLIV), a novel velocity measurement method for microfluidic characterization, is reported. The method records a series of one-dimensional images that represent the trace of particles in the flow across a one-dimensional imager. Linear imaging results in a faster frame rate than planar imaging, allowing observations at larger magnifications, or the measurement of faster flow in real-time than comparable techniques. In contrast to particle image velocimetry (PIV), PLIV captures fast flow dynamics and does not require high-speed cameras or shutters. Furthermore, PLIV is adaptable to multiple linear imager formats and, as one example, can use laser scanning confocal microscopes (LSCMs) that acquire images slowly, but with high optical sectioning resolutions. A higher spatial resolution can be obtained for flows where the in-plane velocity gradient in the direction of the optical path (z direction) is important. 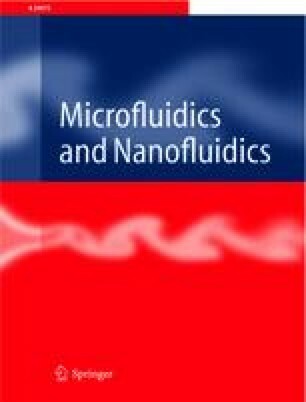 The PLIV algorithm is fully described and its utility is demonstrated by the measurement of: a steady Poiseuille flow with 1-μm spatial resolution in a microfluidic environment; dynamic measurement of transient flows with 250-ms temporal resolution; and the simultaneous calculation of particle dimension statistics. We gratefully acknowledge the support of this research by the National Institute of Health, National Human Genome Research Institute, Centers of Excellence in Genomic Science, grant number 1 P50 HG002360-01, CEGSTech: Integrated Biologically-Active Microsystems.